This is the seventh article in an eight part series on a practical guide to using neural networks, applied to real world problems. Specifically, this is a problem we faced at Metacortex — where we needed our bots to understand when a question, statement, or command sent to our bot(s). The goal being to query the institutional knowledge base to provide answers. This article covers applying the FastText algorithm sentence type classification (statement, question, command). FastText is an algorithm developed by Facebook Research, designed to extend word2vec (word embedding) to use n-grams. This improves accuracy of NLP related tasks, while maintaining speed. An n-gram represents N words prior to the current word to create a single phrase. This provides context to the input similar to the way the RNN interprets the time series aspect and the CNN encodes the spatial aspect of the data. Sentence: This is a test phrase. To clarify, we are using word embeddings as opposed to character embeddings. Using character n-grams can create a more robust network as partial components of words are often shared. However, for our case, we use a combination of words and punctuation, leaving out the parts-of-speech and not using characters. After, the n-grams have been created, the features are then averaged (pooling) and send to the hidden variables. Then we apply a softmax activation function to the output, that’s it! 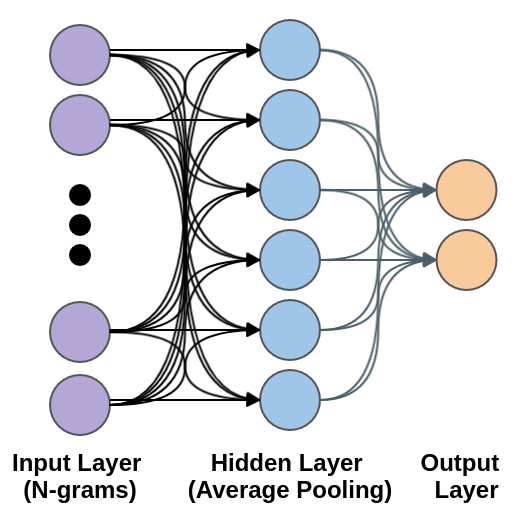 The only change to a standard Multilayer Perceptron (MLP) is using the n-grams as the input and the average pooling for the next layer. The key to FastText is the n-gram creation, so as you may have guessed quite a bit of data formatting is required. Luckily, the idea behind n-grams are fairly well known and even used in common databases such as PostgreSQL (which has built-in trigram searching). There’s a couple of caveats with FastText at this point — compared to the other models, its relatively memory intensive. This is especially true, as the n-grams size increases it will increase the memory usage significantly (uni-gram to bi-gram is 2x the memory). In addition, padding is dictected by maxlen and should be as short as practical. A high amount of padding will dramatically slow down training and classification and increase the memory requirements. With data formatting complete, we can assemble the final components. The FastText accurately classifies ~95.59% of sentence types, on the withheld test dataset. That makes FastText the fastest model; the dictionary check is still the fastest, but horrible accuracy. The next article in the series is a comparison of the models and a brief introduction to hyperparameter tuning.